It was a dreary, wet, Oregon type day here in Japan. Looking at the calendar I only had 9 days until our next ESC Book Club meeting and I had yet to start the book. 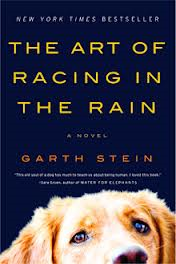 Both of my guys were sleeping so I decided I would embark on the journey through The Art of Racing in the Rain by Garth Stein. As an already over emotional pregnant woman I had put off starting this book from what others had told me, but with an open mind and an extremely quiet house I became one with my kindle. Little did I know that by the end of that day I would be finished and the book would have "spoke" to me like it did. Now the first tug at my heart strings was the cover of the book, only 18 days before reading the book I got the dreaded call my Mom had to take my sweet Daisey Mae in to be put down. Her health and old age had finally caught up to her, now knowing this was coming from prior conversations didn't make it any easy. She was Sawyers best friend and Mine. I miss her short little legs and droopy eyes but know she is in a better place and pain free. Here is a picture of her, see the resemblance to the dog on the cover?! How can you not love that face?! While reading I liked to picture Enzo as Daisey Mae and it made me reminisce about all the good times and fun we had. And I would like to think that in her final moments she was just as at peace as Enzo was. "...memory is time folding back on itself. To remember is to disengage from the present." I had never thought of memories as time travel until now. Talking a walk down memory lane can bring up a variety of emotions depending on what situation and time you are recalling but at the moment you are still in the present, in turn you are folding past and present together. Although we may not be able to physically time travel and change what has happened we can mentally and emotionally relive life events should we choose. Those simple words radiated off my kindle screen and stuck to me. I find power and strength knowing that I can fold time. we are the creators of our own destiny." Such a simple concept indeed. I know many people can agree that you have thought about how your life would be had you not chosen to do something. Catching up with old friends always makes me think of how life would have been different had I chosen to stay in school, stay in the Chico area, not gotten on POF, not have flown to Vegas or other decisions that I made in life that have led me to where I am now. Sometimes life can feel so difficult and we don't understand why we have to endure the hard times and we may not always know the outcome but things will work out. I choose to live life with no regrets. Are there things I probably shouldn't have done, of course! But I feel like when you live with regrets you are weighing yourself down with unnecessary baggage. Make those regrets a mere memory of which you can recall if you need but don't let them weigh you down. We choose our destiny, don't choose to darken your destiny or load by carrying regret with you. Crazy how such a simple concept can be forgotten and we can choose to blame others when things aren't going our way. Next time I try to push blame for feeling like life isn't going how I think it should I will remember this saying! As Denny's career was taking off in the book I found my first Racing Rule that could be applied to everyday life. many have been lost there." I can't begin to even count how many times in a race the pole sitter doesn't win, I'm sure some race analyst could spout out statistics for that . Just because you start out in front doesn't mean you win, but you can however crash or make a wrong turn that costs you the race out as the lights go green. So how did my brain choose to interpret this one you might ask? Take marriage for example. You are so happy and in a honeymoon phase, you may or may not have bickered already, then all of a sudden something happens with your finances or an unexpected expense occurs that puts a new stress on your relationship you never had to endure together before. This is the first corner in the race. Your relationship might make it through the first corner just fine but it doesn't mean that you won and and will be happy forever. But you could however give up the battle and end the relationship because you cant handle the situation and therefore you have lost the race. Or I even took this into consideration as a parent; each day is a race to finish the day with a behaved and happy child. Just because we start the morning off right doesn't mean I have won, but if I choose to let something slide that my child shouldn't be doing I can set the whole day of the track and lost that race. I feel like this could be a saying up on my wall to remind me daily to just keep going and never to give up! The second Racing to Life analogy that stuck out to me. not about who has the heavier foot. The one who drives smart will always win in the end." Life can be challenging and fun at times but no need to rush through things. Life life smart and you will win. I'd like to think that I am driving life smartly and will win in the end. I don't always have the newest things or the most things but I feel like I live smart and have a prosperous life. "The Zebra is something inside of us. Our fears. Our own self-destructive nature. The zebra is the worst part of us when we are face-to-face with our worst times. Overall this was an amazing book and I highly recommend it!